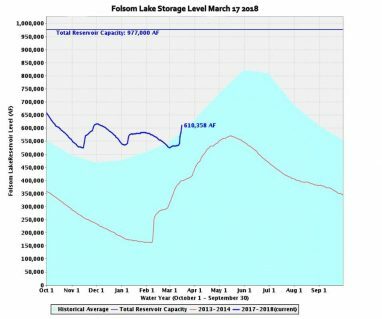 Folsom Lake’s storage has risen by a whopping 78,000 acre feet over the past week, as storms brought much-needed rain to the region. Current storage is at about 610,000 acre feet, which is 104% of the average storage for this time of year, with more rain expected next week. Better yet, the storms dumped several feet of snow in the Sierras, which is the true measure of how our water year will turn out. Experts warn that with the Sierra snow pack at about 65% of normal, it may be too early to call it a March miracle, but it is welcome relief. We’ll know more when nnow pack measurement and water content reports come out next week. Hi Steve - do you have a link to that picture? CDEC changed the link and I've been unable to find it. Thank you! They do make it hard to find. Good news for our water condition for sure.